If you’ve just signed up for your first Muay Thai session… Well done, it’s a courageous first step. It’s a great sport to train and will improve your fitness, confidence and more. But what should you wear to that first session? This quick guide will take you through everything you need for your first class… and then, what you’ll need if you decide to go back and train long term. Dressing for Muay Thai is really simple, you just need to wear something comfortable, loose fitting and light weight. All you need on your top half is a basic t-shirt or vest. It doesn’t need to be a particular brand or style – it just needs to be loose fitting enough to allow for plenty of movement. A tight t-shirt will restrict you when doing burpees, press-ups and throwing punches. Plus, it will be extremely difficult to take off at the end of the session when it’s drenched in sweat. So, keep your t-shirt simple and loose fitting. Again, your shorts for your first lesson don’t need to be anything flashy – just a standard pair of sports shorts will do. You can’t wear jogging bottoms because you will get too hot, and they will restrict your flexibility when stretching and kicking (also you would be the only person wearing them). Short length should be above the knee to give you maximum flexibility throughout the session. Muay Thai is always practised bare-foot so you won’t need to wear socks during training. And that’s it! That is all you need to wear for your first session! Thai boxing is tough, and you will sweat a lot, especially if you’ve never done any similar training before. So, take a decent sized sports water bottle with you to keep yourself hydrated. If you don’t have one, you can pick them up fairly cheap on Amazon. When you start your session, look to see where other people have placed bottles, and leave yours nearby. Be careful not to drink too much, too quickly, or you might make yourself sick. Most coaches will give you dedicated water breaks throughout the session. Muay Thai will make you sweat like no other sport, so you won’t want to travel home in the same clothes you trained in. Always pack a spare t-shirt and shorts or joggers to travel home in. If your gym has shower facilities then you will likely want to shower after your training. If they don’t, it’s good to have a towel to mop the sweat off yourself before changing and heading home. Any Muay Thai gym you train at should have a soft padded floor as the main training area. And most coaches will only want you in bare foot on the padded flooring – no trainers or shoes will be allowed. Having a pair of flip flops makes it easier to nip to the toilet or anything else you might need to do, without having to put a pair of trainers on. If you are training at a gym that offers different martial art styles like BJJ and MMA, flip flops will be very common. If you love your first Muay Thai lesson and want to return on a regular basis, you’ll need to get yourself the Muay Thai essentials. You can pick them up relatively cheap online. Hand wraps are an absolute must for Muay Thai training. They are long pieces of fabric which you wrap around your wrists and knuckles to firm them up and protect them when training. Your hands and wrists have lots of small delicate bones, so it’s vital to protect them when your hitting pads and bags. Here are a few brands I recommend, and I also have a full guide on hand wraps and how to wrap them. 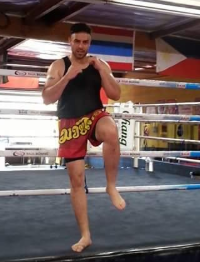 Proper Muay Thai shorts are also needed if you plan to train Muay Thai long-term. They are very short to allow for flexibility, and they look really cool with lots of bright colours and loud designs available. Some gyms will require you to wear them to train, whereas others will be OK with you wearing basic gym shorts for a while. Again, I have a full guide to Thai shorts here. The next stage of your Muay Thai journey will be sparring. Sparring is an excellent way to hone your skills and is also a lot of fun; but you need the right gear to make sure it’s safe for you and your sparring partners. Here is everything you will need to spar safely. As you can probably imagine, taking a stray knee or shin to the groin isn’t much fun. In fact, it’s probably one of the most painful things I’ve ever experienced. I have a more detailed guide on groin guards here. Sparring will inevitably involve you taking some shots to the head, and even though they should be controlled shots in protective gear – there’s still a risk to your teeth. Wearing a mouthguard eliminates that risks and ensures you keep your smile. I have a full guide to choosing and fitting a mouth guard here. The shin is the second heaviest bone in the body, and one of the most sensitive. This combination means that you must keep them covered in order to protect yourself and your sparring partners when throwing and blocking kicks. Some gyms will provide shin guards, and some will expect you to buy them. I personally think it’s nice to have your own pair even if they do provide them – so you don’t have to share. I have a detailed guide to shin guards here. Gloves are another essential piece of gear that you should never spar without. They protect your hands from injury, and prevent you from cutting and bruising your partners. Again, some gyms provide boxing gloves to share amongst their classes, but I much prefer to have my own pair – because the shared ones usually smell really bad, and are often in bad condition. See my full guide to Muay Thai gloves here. If you’re just starting out in Muay Thai, then your gear requirements are very simple… a pair of shorts and a t-shirt! As you progress, you will need to invest a bit more in hand wraps, shorts, and eventually sparring gear. You don’t always have to spend the earth on the basics, but when it comes to protective gear, you must get high quality gear that will protect you properly. Don’t forget to check out my training tips on the blog too.